This post has been sponsored by PRIMP Network and SUZANNE Somers Organics. As always all opinions are 100% my own. Thank you for supporting brands that help me bring you great content! If you ask anyone who Suzanne Somers is, they will tell you. As a person who's career has spanned more than three decades, she is an American icon. But what alot of people don't know is that after Suzanne was diagnosed with and beat cancer in 2001, she decided that there were too many toxins in beauty products and "clean living" was the way to live; so she created "Suzanne Organics". 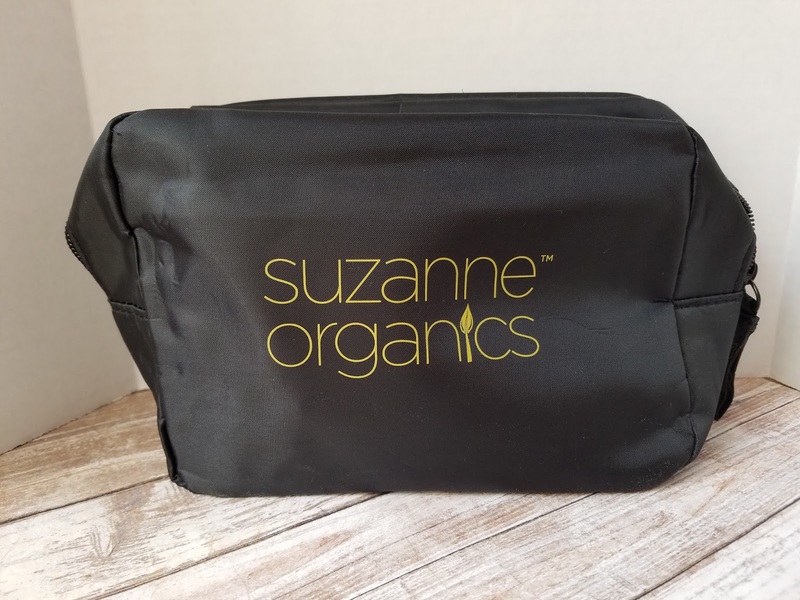 SUZANNE Organics is a cruelty-free organic line of beauty and health products that are made with "natural botanical extracts, enzymes, skin-nurturing anti-oxidants, organic fruits and vegetables. From nourishing skin-care to flawless make-up, these products were designed to help you glow." The brand carries hair care, makeup, nail care, skincare, and health products (which include supplements, home cleaning, etc). The SUZANNE Organics website also offers all of Suzanne's "as seen on TV" products which includes the 3way poncho, books that she has authored, the ThighMaster, the FaceMaster, jewelry, and accessories. 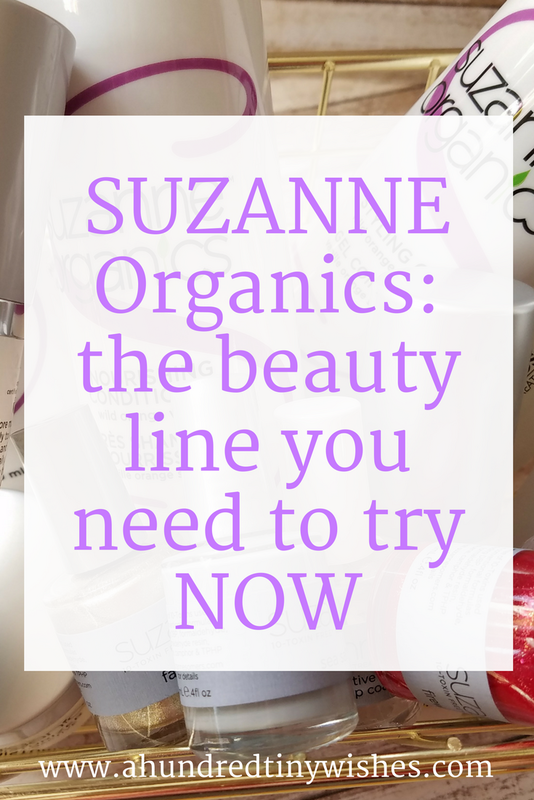 Since I have a soft spot for cruelty-free and natural beauty products, I was able to try out some products from the SUZANNE Organics line AND I have one thing to say, "I am in love!" SUZANNE Organics 3-piece complete hair care set. The three piece set includes the nourishing shampoo, hydrating conditioner, and styling gel. What makes this line different than other "natural" hair cleansing products is in the ingredients. Most shampoos use harsh sulfates, detergents, and foam boosters that actually strip the hair of natural oils, but this one actually uses cocoa butter cleansers for a mild lather to gently and thoroughly clean the hair with no residue. The same goes for the conditioner- instead of heavy silicons and sulfates, high performance superfoods strengthen the hair shaft while enhancing elasticity for shiny, stronger, hydrated, more luscious hair. The styling gel uses natural ingredients to provide soft control for shiny, manageable hair. I can attest to the beautiful work of the shampoo and conditioner. At birth I was blessed with fine and thin hair, and truth be told, almost every line of shampoo and conditioner weigh it down. In the past year I have been searching for something to give my hair life. I mean, I was almost about to go with the "No Poo" method because I was desperate for some volume. 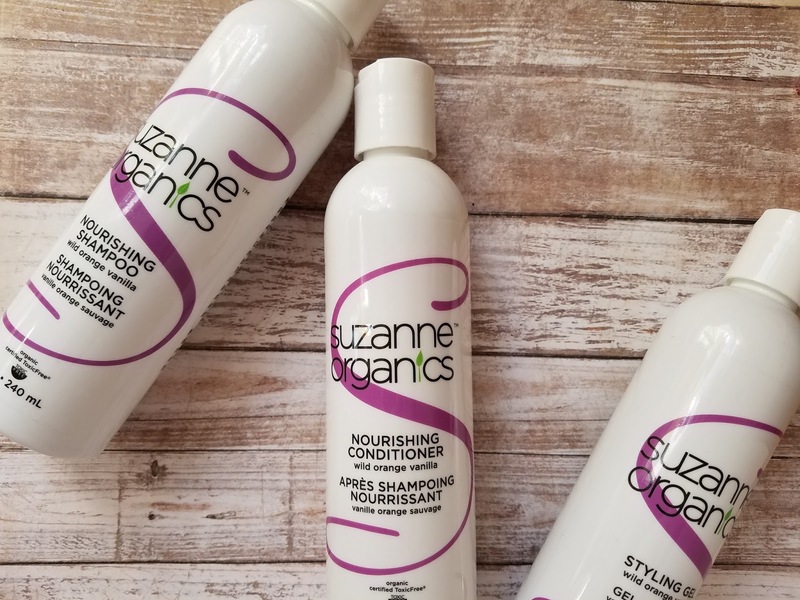 After one use of the SUZANNE Organics shampoo and conditioner, I was hooked! My hair had volume and felt light and airy. ALSO- the scent was almost like a dreamsicle. True Brazilian Activating Serum and Finishing Gloss Combo. The idea behind the combo is to provide an at-home salon-style, anti-frizz treatment with no harmful added chemicals. 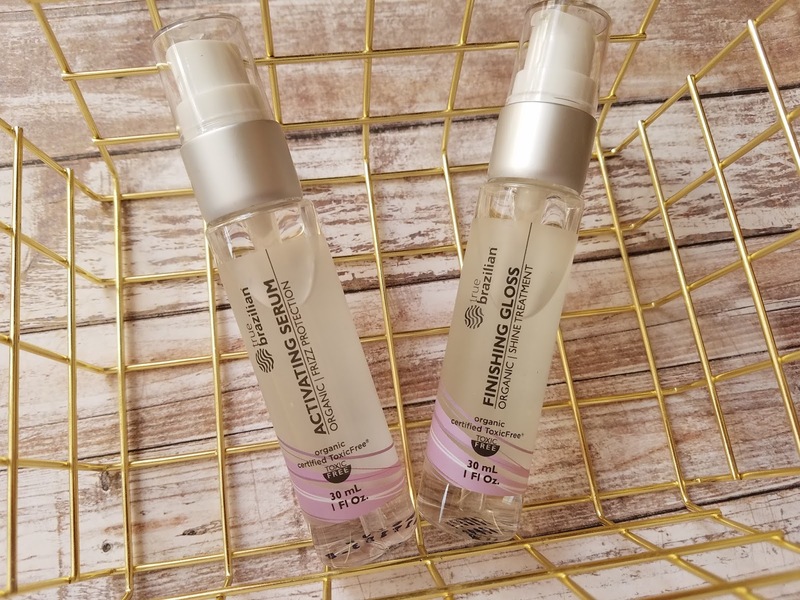 After showering, the Activating Serum, which features Meadowfoam Seed Oil and Abyssianian Seed Oil for moisture and conditioning, is placed on the hair. Then the hair is dried with a hair dryer and the serum gets absorbed into the hair cuticle. The Finishing Gloss, which is jam packed with Argan and Vitamin E oils, enhances the elasticity, strengthens the hair, helps split ends, and makes the hair feel moisturized and soft. I truly love the True Brazilian duo. Along with thin and fine hair, I also have a lot of damage and flyaways. After showering, I love putting on the serum, blow drying my hair, and then adding the finishing gloss. My hair feels so healthy afterwards! It doesn't have a perfumy smell or feel greasy like other treatments. It also doesn't weigh down my hair, which is a plus! 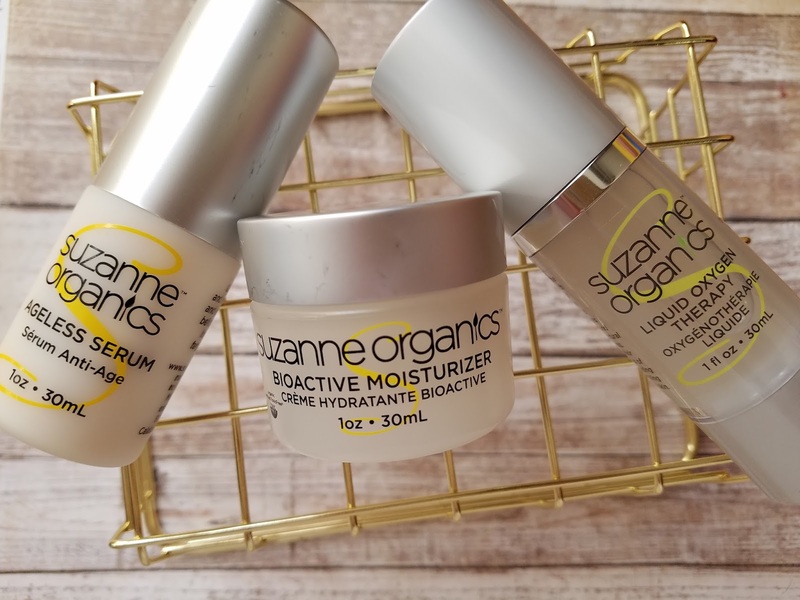 SUZANNE Organics 3‑Piece Bestsellers Skincare Kit. The 3-piece set includes the Ageless Serum, Bioactive Moisturizer, and Liquid Oxygen Facial Serum. The three products together target fine lines and wrinkles for a more youthful, glowing complexion. The Ageless serum is biotanically loaded to provide extreme repair to stressed, aging skin. The Bioactive Moisturizer has natural, botanical active ingredients, like CoQ10, Argan Oil, and Sea Buckthorn Berry, that work together to protect, moisturize, and protect the skin. The Liquid Oxygen Facial Serum is like having a high-price oxygen facial in a bottle. The formula helps reverse the visible signs of aging while helping to promote healthy looking skin. Being in my 30s I care about products with anti-aging properties/ingredients. I really like the Liquid Oxygen facial serum. I have rather sensitive skin that is usually irritated after waking up. The first time I put the serum on, my face drank it in and calmed down. I love how it soothed my face and didn't have any type of synthetic fragrance/smell. The Ageless serum and Bioactive Moisturizer didn't irritate my skin or have a weird smell either. 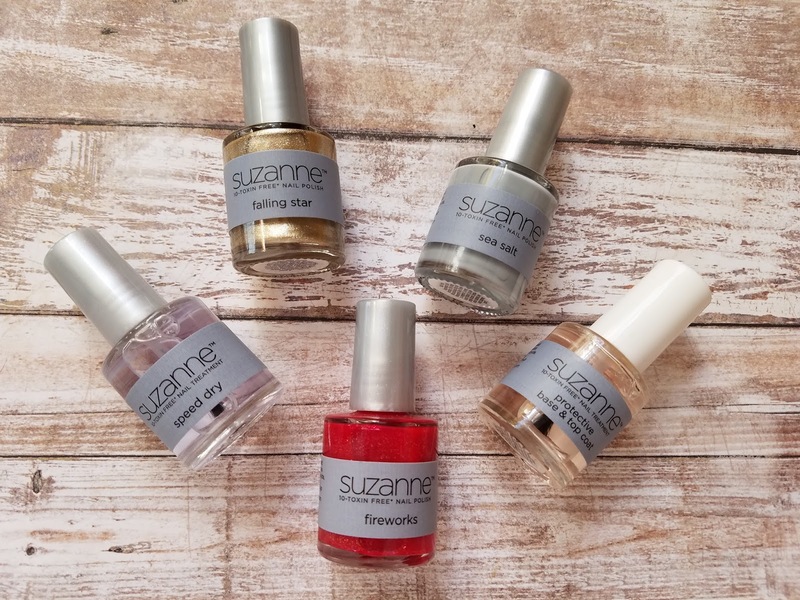 SUZANNE 10‐Toxin Free Nail Polish. 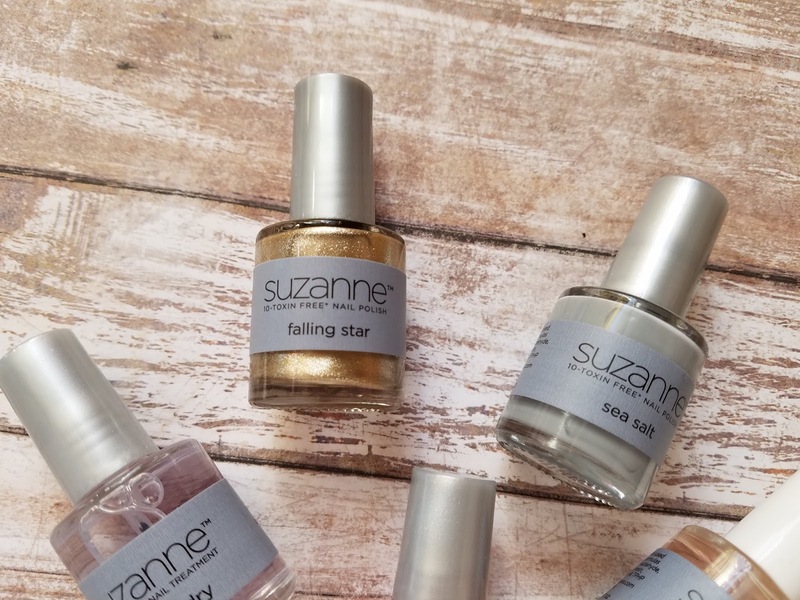 Just like the title, SUZANNE Organics nail polish is 10 free, meaning that it is free of the top 10 toxins in regular nail polish. The formula is also chip resistant and long lasting. The nail polish comes in 11 shades and also features a protective top/base coat and speed dry. I was able to try out the protective top/base coat, speed dry and 3 colors: Sea Salt (a blueish grey), Fireworks (red), and Falling Star (metallic gold). I really like the protective top/base coat- I have tried it with and without the nail color, and it works the same. It seems to help protect my nail and made my mani last. My favorite of the colors is Sea Salt since I am into muted colors. The formula went on super smooth and dried quickly; I only needed one coat, but put on two; and the color lasted for a good 6 days. 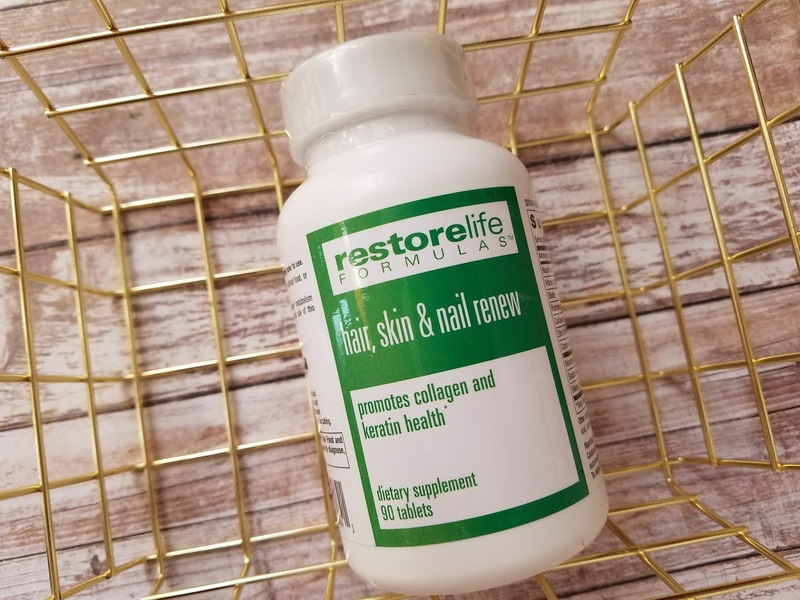 RestoreLife Formulas Hair, Skin & Nail Renew (30-day Supply). The supplement is packed with clinically studied nutrients that promote collagen and keratin health, and they work together to help restore beautiful hair, radiant skin, and healthy nails. These statements have not been evaluated by the Food and Drug Administration. This product is not intended to diagnose, treat, cure or prevent disease. As always, please consult your personal physician before taking any dietary supplements and before beginning any diet or exercise program. I truly believe in the power of supplements. Let's face it, sometimes our bodies need a little bit of help to replenish different parts, ie. hair, skin, nails, and that's where supplements come in. 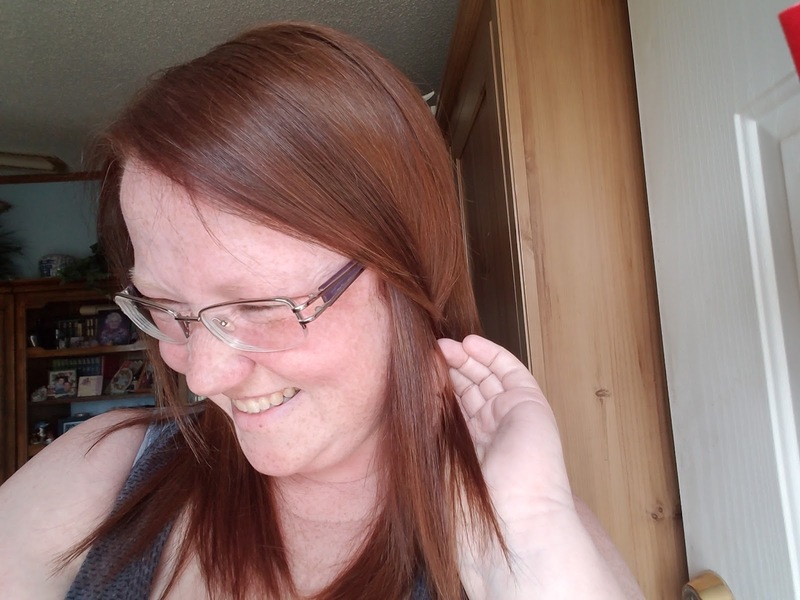 I personally have taken biotin and keratin to help with my hair and nail growth, especially after my son was born, and saw a difference in my hair texture. 3Way Poncho. The 3Way Poncho can be worn as a cowl neck, off the shoulder, or as a hoodie. It features a lightweight fabric and can be dressed up or down. The 3Way Poncho comes in a 2 pack with the colors black and mocha, and is available in two sizes: Missy (which fits up to size 14) and Plus (which fits size 15 and higher). Everything that Suzanne Somers has been through healthwise enabled her to develop beauty and health products that are pure and clean, easy and fun! I have had a great time trying out her products and I definitely recommend them to anyone who is looking for a toxin free and clean lifestyle. 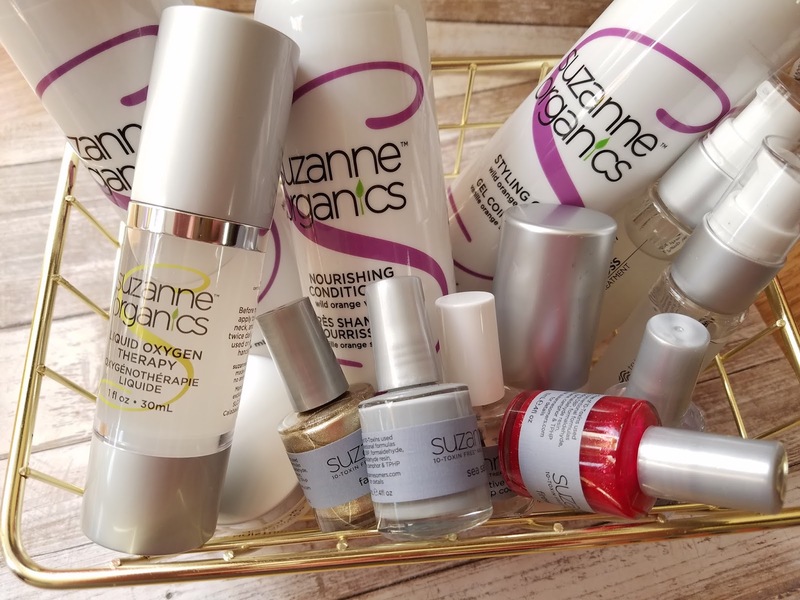 SUZANNE Organics also features a line of cosmetics which is made with skin-nurturing ingredients like shea butter, jojoba, aloe, argan oil, grape seed oil, bamboo powder, tapioca, rich mineral powders, raspberries, oranges, Vitamin E and more. I have seen the beautiful colors and I will be buying myself some in the near future! If you don't believe that SUZANNE Organics are worth it, just go read reviews from Taneja's Bride and Honestly Hannah and see for yourself what other people are saying. If you are interested in trying any of the Suzanne Sommers products, you can use code 'PRIMP20' for 20% off your entire order. 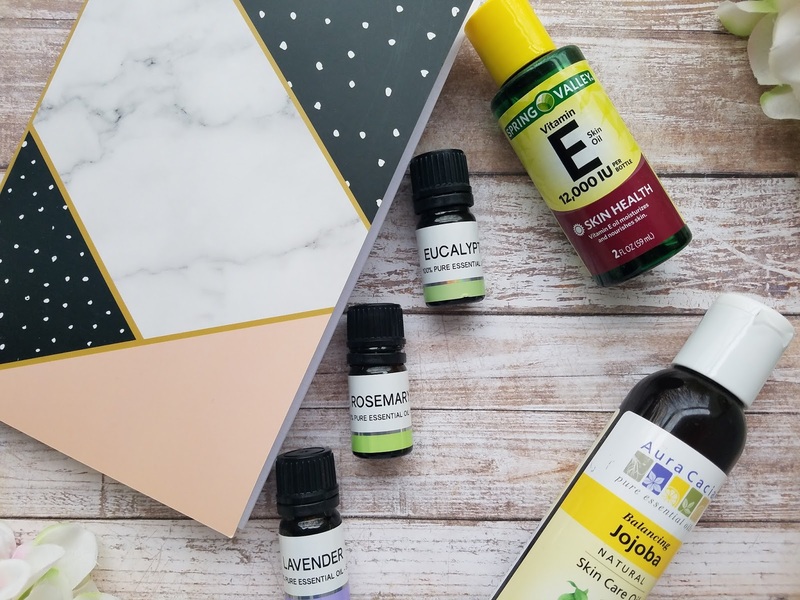 Over the past few months, I have been getting into the habit of using oils in my everyday life. Oils, which include argan, coconut, jojoba, lavender, rosemary, etc, are great for cleaning, beauty, diy projects, and of course, cooking. When it comes to beauty, there are two types of oils: carrier and essential. Carrier oils, better known as base oils, are used to dilute essential oils before they are applied to the skin. Essential oils are "concentrated hydrophobic liquids containing volatile aroma compounds from plants" (source). Confusing? Yeah, I thought so. Well, to simplify it, essential oils are the oils from a plant. In my opinion, the best carrier oils include fractionated coconut, jojoba, vitamin E, and argan. Fractionated Coconut oil stays in a liquid state and is great for softening as it penetrates the skin easily. Jojoba oil is a very lightweight oil, is very similar to the sebum in skin, and has anti-inflammatory properties. Vitamin E oil is great for scars, stretch marks, and has antioxidant properties that are great for the skin. Argan oil absorbs easily, is not greasy, promotes hair growth, and is a great natural moisturizer. 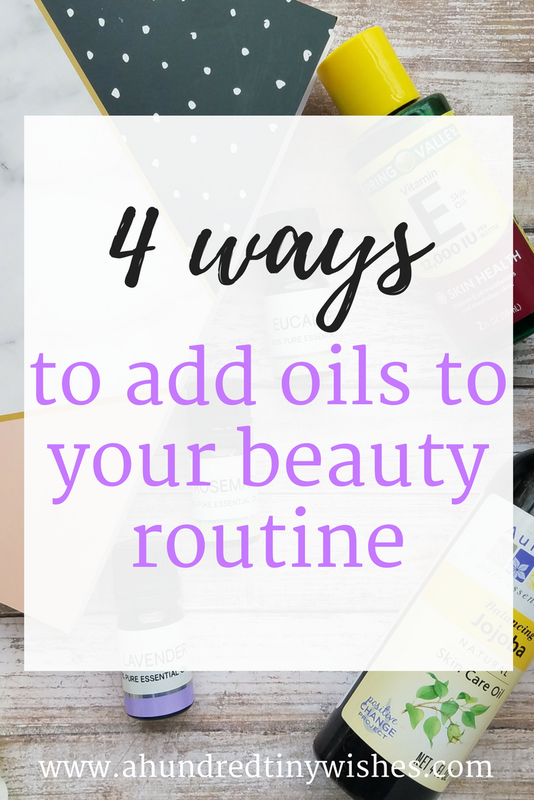 Now that we know some things about carrier and essential oils, lets find out how to add them to our beauty routines. Use coconut oil as a hair mask. When looking for a DIY hair mask on Pinterest, coconut oil is at the forefront of about 90% of them. Why? Because coconut oil in a solid state is an amazing deep conditioner for your strands. It's chemical free and jam packed with antioxidants, has antifungal and antibacterial properties, and adds moisture to your hair. Add a few drops of rosemary essential oil to your shampoo to help hair growth. Rosemary essential oil is great for hair loss, balding, dandruff, and moisturizing the scalp. The miracle oil is believed to increases cellular metabolism that stimulates hair growth. Mix oils together to make a luxurious cuticle oil. The way to grow long and healthy nails isn't by applying commercial nail growth formulas, its by moisturizing the cuticles and nail beds. The healthier the cuticle is, the healthier the nail will be, and the more growth you will see. I love to mix vitamin e, jojoba, and lavender essential oil. It smells so calming and makes my nails look so hydrated. Help your eyelashes grow naturally. Other than adding coconut oil to your hair as a DIY hair mask, the second most popular piece of advice is to add castor oil to your eyelashes for growth. It is proven to make eyelashes thicker, stronger, and make them grow faster. The easiest way to apply castor oil is to either use a new spoolie brush or an old, cleaned mascara wand, dip it into the castor oil, and brush on at night. Using oils in your beauty routine is not only natural, but it's cruelty-free. The other nice thing about oils is how readily available they are. 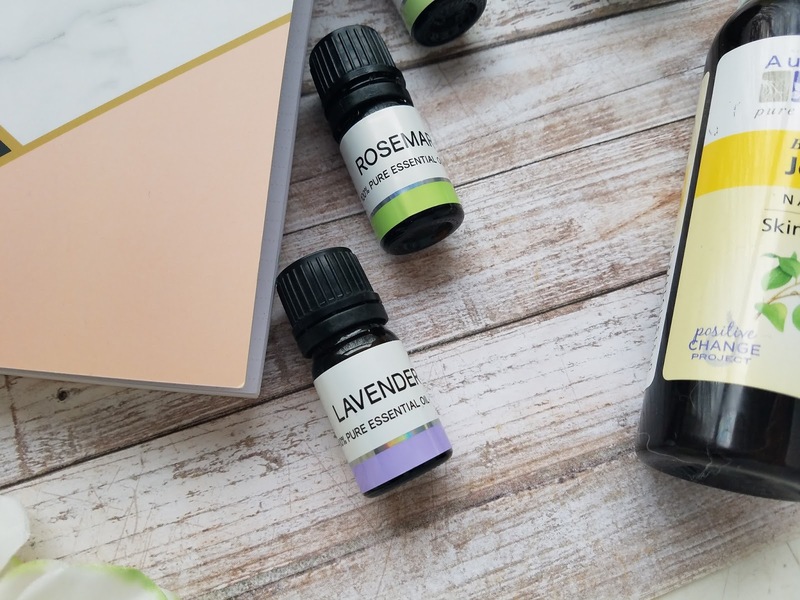 You can find carrier and essential oils at your local supermarket, on Amazon, at Target & Walmart, and you can even find oils in your current beauty products. Have you ever used oils in your beauty routine? Which ones? Coffee, coffee, coffee... who loves coffee? We all do, so today I am teaming up with a bunch of bloggers to bring you a little Starbucks Instagram giveaway. All you have to do to enter is follow a bunch of awesome Instagram accounts and bam, you're in! Rules: Use the Rafflecopter form to enter daily. Giveaway ends 3/30 and is open worldwide. Winner will be notified via email. 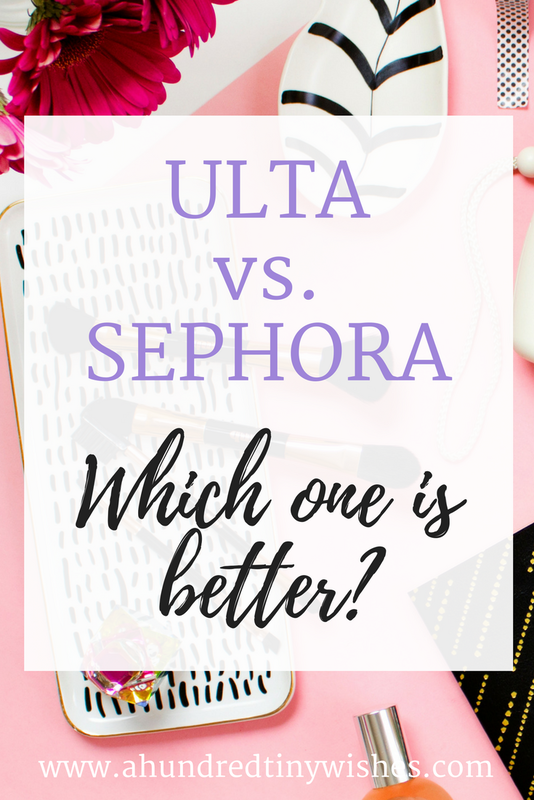 Ulta vs. Sephora: Which one is better? True to my Twitter bio, you can usually find me in the beauty section of some store. Beauty products are my FAVORITE thing to shop for; especially at Ulta or Sephora. To be honest, whenever I visit either, I feel like a kid in a candy store. I mean all of the pretty things that surround you, smells that entice you, and prices that don't break the bank (most of the time) make shopping at a high end beauty store worth it. But the question is: which one, Ulta or Sephora, is actually better to shop at? Today we are breaking down the barriers between the two competitors and ranking them in terms of stores, products, reward systems, available coupons, return policies, customer service, and overall experience. So lets get this fight started! Ulta and Sephora are very similar, but they are also very different. Store wise, you can find more Sephora stores mainly because Sephora offers a condensed store inside of JC Penney. You will be able to find their more popular products, like makeup, limited skincare, fragrance, and now some hair care. You can also get your 3 samples, but if you want the full Sephora experience, you will have to visit a stand-alone store or shop online. Ulta on the other hand, has stores only in major areas, but they are full stores, with a full service salon. Every product that Ulta sells, unless it's an online only product, will be in each Ulta store. In the store category, Sephora wins for the most locations. When it comes to products, Ulta and Sephora have similar lines. Both carry prestige lines of makeup, skincare, and hair care, but Ulta also carries drug store items and has a full service salon. Both stores have their own "house line" of makeup line and they are both very good lines; Ulta's collection of cosmetics is cruelty-free, but Sephora's is not. You can find and abundance of sampler kits at Sephora, and just last year, Ulta started to follow suit with the kits. Ulta now offers budget friendly sampler kits featuring skincare and hair care. Sephora generally offers fragrance, skincare, and makeup, but they are starting to have hair kits too. In the product category, Ulta wins for most diverse products. Both Ulta and Sephora offer a reward card, but both have very different rewards. Ulta's program, called Ultamate rewards, is based on points and when you accumulate enough points, you can "exchange" them in for money off your purchases. There are two different levels- regular and platinum, and when you achieve the platinum level, you get more perks: faster accumulation of points, bonus points, and even a second birthday gift. Sephora's program, called Beauty Insider, is also based on points. Once you accumulate enough points, you can "cash" them in for products. The products are usually sample size, but you get a 1 point for every $1 you spend. The main perk of Sephora's Beauty Insider program is the VIB and VIB Rouge sales. Unfortunately they announced earlier in the year that the points are going to expire now. Before, they didn't. In the point system category, Ulta and Sephora tie. Personally if you love money off, then Ulta is your go to, but it you love extra product, then Sephora is for you. Sephora usually does not offer coupons. Sometimes you can buy a sampler kit and get a certificate for a full size product or received a mailer with a certificate for a free product, but they hardly EVER offer coupons for money off. The only time you can score money off is during the VIB and VIB Rouge sales. *This year they started doing a $25 off 50 for Rouge, $20 off 50 for VIB, and $15 off 50 for Beauty insiders, but they were one time use coupons. Ulta, on the other hand, is always offering coupons. On the backside of their monthly mailer, there is always a coupon for $3.50 off a $15 purchase. They randomly send out coupons for 20% off and if you are Platinum, during your birthday month you will receive a $10 off any purchase coupon. They are always offering sales on their products, liked buy 2 hair care products get 1 free, etc. In the coupon category, Ulta wins, hands down. Sephora and Ulta both have good customer service. I personally have had excellent and bad service when visiting both places; but I do prefer Sephora. Sephora employees are very nice (as long as they aren't busy) and they are willing to help you if you just don't have an idea. My favorite thing about Sephora is the fact that their gals know their sh*t. If you walk into a store and ask if they have cruelty-free or vegan products, chances are they will be able to point you to them. Ulta, on the other hand, maybe not so much; but if you need a great shampoo for colored hair, then all you have to do if find one of the employees with non-natural hair and they will point you in the right direction. In the customer service category, I have to say that Sephora wins for the sheer fact that the majority of the workers are VERY knowledgeable about their products. Both stores have a good return policy. At Sephora, you can return a product within 30 days with a receipt to get your money back, and after that, you can get an even exchange or store credit. Even though it's not listed on the website- my personal experience tells me that you can return a used product as along as there is at least 50% left and get store credit. At Ulta, the time limit is 60 days, but must be returned with a receipt. If you are unable to find your receipt, Ulta also has the ability to look up your purchase if you are a Ultamate rewards member. In the return policy category, Ulta wins for the longest time. Sephora offers 15 minute targeted makeovers and 45 minute whole face makeovers. With the 15 minute one, you can choose from a variety of targeted areas- eyes, lips, brows, contouring, etc, and the worker will do one half- while teaching you, and you will do the other half. With the 45 minute whole face, they will do a full makeup for you and it's free with $50 or more purchase. Sephora also offers 3 free samples every visit- no purchase necessary. The samples are usually generous size and it's a great way to try out new foundations, bb creams, moisturizers, etc. Ulta has a salon and the Benefit Brow Bar in store. With each service, you can earn points towards a reward, but not redeem them. Ulta also does not offer samples. The only samples that you can get are the ones in a sampler kit. I personally have tried the salon at Ulta and LOVED the service. Yes, it was pricey, but the stylists were super nice and I felt like a million bucks when I was finished. Oh, and yes, I was able to earn "points" for my salon "purchase". 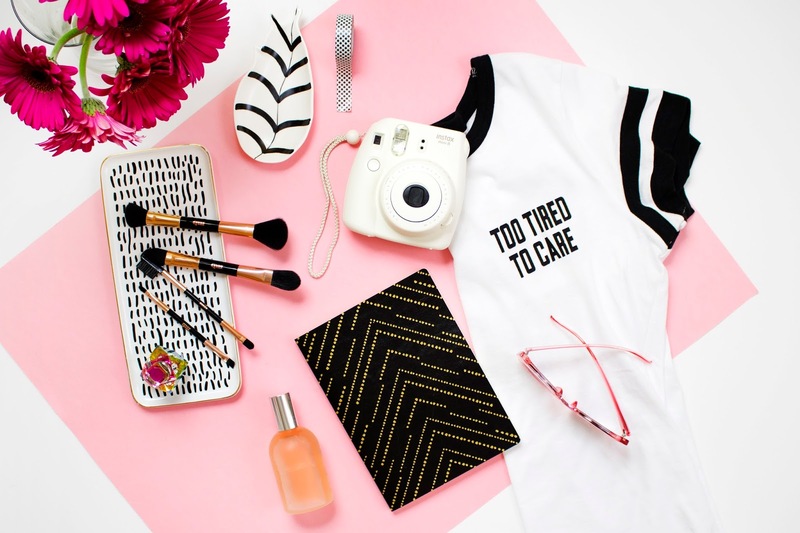 Are you an Ulta or Sephora type of gal?